Ally McCoist's future as Rangers manager could be decided on Wednesday when he is due to meet with members of the Scottish Championship club's board. The 52-year-old handed in his notice on Thursday but remained in charge for the 2-0 defeat by Queen of the South in Dumfries 24 hours later. 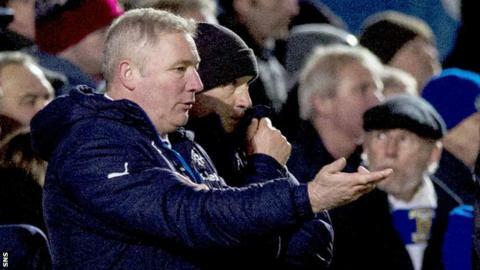 After the match, McCoist said he still hoped to lead Rangers to the Scottish Premiership and be boss next season. The former Rangers striker has a 12-month rolling contract at Ibrox. And it is believed that the Glasgow club do not have the funds to pay him off immediately. Newcastle United owner Mike Ashley presently holds the financial power at Ibrox. His company, Sports Direct, has a retail agreement with Rangers, they have become reliant recently on loans from Ashley to finance their operations and further funding will be required in January. Derek Llambias, the former Newcastle managing director, recently became a consultant to Rangers along with Barry Leach, a Sports Direct executive, and has since been appointed to Rangers' board. Rangers' annual meeting is due to be held next Monday with the club presently still without a chief executive and financial director after the departure of Graham Wallace and Philip Nash in October. News of McCoist handing in his notice emerged with most of the club's board involved in meetings in London. The defeat in Dumfries left Rangers nine points behind Championship leaders Hearts, who have a game in hand following Saturday's postponement of their match at Cowdenbeath.